In recent years, there’s been a growing discussion among architects, designers, and engineers around the office environment and its impact on productivity and absenteeism. Indoor environmental quality factors such as views, daylighting, indoor air quality, and thermal comfort have all been shown to have significant positive impacts on employee health and performance. 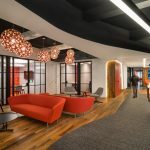 These design features should consistently be integrated in your workspace, focusing on strategies proven to improve the user experience and owner operations. Here, we look at what the research says about these four major impact areas and explore design best practices to unlock the interrelated performance benefits of sustainable design. Holistic and sustainable design brings together concepts that are intertwined and lead to a common goal of peak performance, creating an enhanced workplace. Image © DLR Group. The sweet spot for sustainable design is finding overlapping concepts that enhance building operations, employee health and wellness, and community benefit through environmental stewardship and innovation. Image © DLR Group. Design publications and AEC firms alike espouse views: views of the city, views of the landscape, views of the clouds. But views are a scientifically legitimate design feature that can be applied in many of today’s renovated and newly constructed office buildings. Research that highlights the magnitude of the impact of views highlights a 10-15 percent reduction in absenteeism, improved sleep cycles, and lower markers of stress. Here, we share some more information about three of these research studies. A 2011 study by Ihab Elzeyadi examined an open-plan office building at the University of Oregon where 30 percent of the offices overlooked trees and landscape; 31 percent overlooked a street, building, and parking lot; and 39 percent had no view. The study linked a 10 percent reduction in occupant sick days to both view of nature and exposure to daylight. In a 2010 study comparing an older workspace with limited access to windows reducing both daylight and views of nature, to a newer workspace with better views and increased exposure to daylight, psychologist Julian Thayer and his team found that workers in the new space had lower markers of stress, improved indicators of heart health, better sleep cycle, and lower stress outside of the workplace. Research on views of nature and its effects on our attention span and mood conducted by Rachel and Stephen and Kaplan noted that nature seemed to have a variety of beneficial effects on human attention and focus, whether it was after a walk in a natural setting or just viewing nature through a window or in a photograph. They coined the term attention restoration theory (ART) to explain how, by providing biophilic images that only demand our “soft” or low-effort attention, nature helps to restore our focused, or effortful, attention. Use building form and depth, orientation, and external shading to ensure views are truly available to all occupants. Enhance views through use of landscape, stormwater design, and biophilic patterns. Image credits: Design by DLR Group. Photo by Chris Roberts. Building form and depth establishes opportunities for views to the outside. Limiting the depth of the building floor plate so the deepest workstation is less than 25 feet away from the perimeter, and designing the building form to generate views, can provide enormous opportunities from the get-go. Building orientation and external shading for windows is one of the most important features that can enhance views for all occupants. Providing external shading ensures that glazing will be shaded from direct sun or glare, allowing the internal shades to stay up, preserving the view to the outside. Landscape or nature views are key to a quality that impacts productivity and behavior. Natural views tie into human kind’s innate need for a connection to nature, natural forms, or patterns, a concept known as biophilia. Site design and building form provide opportunities to create such views when they are not part of the natural landscape. Storm water design can create opportunities for views of water, green walls, and green roofs. These strategies need to be carefully vetted from a maintenance standpoint but can enhance views. Setting a goal for views is key to achieving it. Establishing a goal based on providing views for most employees may be more effective than the percentage of square feet with views. Certifications such as LEED and WELL will give projects credit for quality views and can help establish criteria for what constitutes quality views. Research studies mention that daylight “helps set our circadian rhythm” and that “sunlight is important for mood.” Even when the workplace has sufficient artificial lighting for employees to see well and perform their daily tasks, occupants may still not be getting adequate sunlight exposure to support healthy circadian rhythms. In winter 2013 and summer 2014, Mariana G. Figueiro and Mark S. Rea studied lighting in an office building and the impact of personal light exposures on sleep and mood during summer and winter. The researchers found that while artificial lighting was supportive for the work tasks at hand, employees still suffered from lower moods and less restful sleep in winter when the windows provided less natural light. A study conducted by Jeanne F. Duffy and Charles A. Czeisler in their paper Effect of Light on Human Circadian Physiology investigated the effects of light on the human circadian timing system. These studies have revealed how the timing, intensity, duration, and wavelength of light affect the human biological clock. Daylighting is a large part of what provides people access to the natural environment. Use daylight and biophilia forms and patterns to enhance user experience and reduce lighting energy consumption. Image credits: Design by DLR Group. Photo by Sam Van Fleet. Building orientation and external shading for windows can ensure access to glare-free, useful daylight. Providing external shading ensures that glazing will be shaded from direct sun, or glare, allowing internal shades to stay up and preserve comfortable access to natural light and views. Building form and depth lays the foundation for access to daylight. Limiting the depth of the building so the deepest workstation is less than twice the height of the window from the perimeter can provide enormous opportunities for natural light penetration. Designers can improve the uniformity of daylight and reduce glare by limiting space depth, providing glazing on two perpendicular walls, or by installing skylights. More glazing is not more daylight. Glazing should be strategically located to maximize uniform daylight. Clerestory windows can help daylight penetrate deeper into the space. Daylit windows should be placed strategically to reflect off vertical surfaces. This tends to brighten the surfaces, making the space feel well lit. Selecting the right glazing and technical specifications is key to achieving glare-free daylighting. Glazing specifications to consider include visible light transmittance (VT) and solar heat gain coefficient (SHGC), which limits heat gains in interiors. These attributes often conflict, so it is key to find glazing that can balance both the SHGC and VT. Surface reflectance has a huge impact on daylight perception and foot candles in the space. The ceiling reflectance should be the highest, greater than 80 percent, walls greater than 70 percent. External surfaces that reflect light into the interior spaces should also be lighter to increase reflectance as needed. The quality and quantity of air in the spaces we inhabit has a direct impact on our health, well-being, and cognitive function. The impacts can vary widely, depending on multiple factors including the quality of indoor air and the concentration of contaminants, the rate of intake or quantity of outside air supplied, and the length of exposure to the air or the amount of time spent indoors. Sample Health Product Declaration Label from Declare. Image courtesy of International Living Future Institute. Studies like one from Allen et al have shown that “green” workspaces with higher outdoor ventilation rates can improve cognition and task performance by removing harmful compounds from the air. Participants completed office-type tasks during exposure to varying concentrations of airborne volatile organic chemicals (VOCs) and carbon dioxide. The study tested three environments: high concentration of VOCs, or conventional; low concentration of VOCs, or green; and low concentration of both VOCs and CO2, green+, which are typical characteristics of a system with a high outdoor air ventilation rate. The study found that the green environment improved cognition by 61 percent, and the green+ environment by 101 percent. Reduce off-gassing with low-emitting materials and post-occupancy maintenance. Use health product declarations (HPDs) to find solutions that minimize toxic ingredients and off-gassing. Certain building product certifications and labels, such as Declare, Cradle to Cradle, and Greenscreen vetting, can aid in simplifying material selections. This can include paints and coatings, interior adhesives and sealants, flooring, insulation, and furniture and furnishings. It is important to simultaneously ensure product durability and ease of maintenance without the use of toxic cleaning products. Also maintain an operational standard that includes using nontoxic cleaning products that do not include pollutants. Source filtration, including air intake and building entrances. Ensure all entrances are provided with design solutions to minimize entry of contaminates, such as entry mats for source pollution control. Provide HVAC outdoor air intake away from sources of pollution, and smells from traffic, restaurants, and other distinguishable sources. Providing filtration with Minimum Efficiency Reporting Values (MERV) like MERV 13 or MERV 15 and/or carbon gas filters might be a good solution for locations where there are recurring issues with outside air quality from factories or fires. It is also important to factor in the impact of fan energy consumption with the use of filters. Enhance IAQ through taller ceiling heights, indoor plants, innovative mechanical solutions. Pictured here, chilled beams provide 100 percent outdoor air, increased outdoor air through primary flow requirements, and energy savings through zone heating and cooling. Image credits: Design by DLR Group. Photo by Sam Van Fleet. Use innovative mechanical design tactics to increase outside air at breathing zone while minimizing energy consumption. These tactics and solutions should include energy performance as part of the decision-making equation. Mechanical design that keeps energy consumption and CO2 emissions low while maximizing air quality is key to improving air quality both indoors and outdoors. Some options include decoupling outside air ventilation from conditioning systems; for example, chilled beam systems or radiant systems; or using displacement or under-floor air systems that increase ventilation effectiveness by supplying air closer to occupants’ breathing zones. Integrating the use of operable windows may also be a source of additional outside air in areas with clean air and minimal noise. As part of the post occupancy plan, ensure a schedule is in place for the continuous cleaning and maintenance of the air filters. Use select indoor plants to help filter indoor air and improve the quality of the circulated air. Design an interior landscape that can enhance biophilia, and selectively enhance air filtration. If possible, you should work directly with your facilities team to ensure a plant maintenance program is in place. Air quality testing can be a final confirmation on whether the set air quality standards have been met. Testing can include periodic spot checks and measurements or track ongoing measurements through air quality sensors. This tracking can help capture the impact of changes in the indoor environment that may be increasing contaminants in the space. Thermal comfort is a topic of discussion in offices everywhere you go. Age, gender, and clothing choices have all been explored as potentially contributing factors to thermal comfort. Recent studies have attempted to quantify lost productivity and its link to temperature through examining ability to perceive a change, memory, critical thinking, decision making, motivation, and accuracy on math and typing, and discovered that there appears to be an optimal temperature range in which people at their best (typically between 71° Fahrenheit and 75° Fahrenheit). Factors that affect thermal comfort include clothing, metabolic activity, indoor air temperature, humidity, radiant temperature, and air speed. In addition to these conditions, acceptable thermal conditions can also shift if the space is naturally conditioned with user-controlled operable windows. This shift or method is also called the adaptive thermal comfort model that relates acceptable indoor temperature ranges to outdoor climate parameters. The 2013 edition of ASHRAE 55: Thermal Environmental Conditions for Human Occupancy specifies a number of methods to help determine indoor thermal environmental conditions that a significant number of occupants would find acceptable, and details thermal comfort for mechanically and naturally ventilated spaces. Control solar gains along perimeter spaces with external shading devices to limit the temperature delta through the depth of the room. Controlling direct solar gains reduces the difference in temperature experienced by people within one space, keeping the operative temperature consistent. Providing thermally variable spaces lets users elect their workspace based on thermal preference. Our comfort expectations also change based on whether we are in an outdoor space or indoor space that is naturally ventilated. Alliesthesia, or a positively or negatively perceived change to a sensory experience, is used to differentiate thermal pleasure from thermal neutrality and acceptability. We seek an environment in which our body holistically feels comfortable not in spite of but because of varying conditions. Individual or personal thermal controls can enhance how thermal comfort is perceived. These controls can allow a person to control their comfort set-point. Desk fans or a user-controlled thermal chair gives an individual control over the immediate thermal environment without affecting the environment and comfort of other occupants. Zone cooling and heating systems, decoupled from ventilation, that can cycle on and off can improve thermal comfort. Cooling and heating through radiant systems that focus on operative temperature, or the average between air temperature and the mean radiant temperature rather than solely air temperature, can improve comfort for people. ASHRAE 55 also establishes an acceptable operative temperature range for naturally conditioned spaces. These are just four of the many indoor environmental quality factors that affect both the performance of a building, and how employees feel about their jobs. Evidence of the links between physical environment and a thriving workforce are increasingly influencing the thought process that underpins design. Several of the design strategies included here overlap and can enhance the indoor environment in multiple ways. These approaches can also help with creating spaces that benefit the environment through reduced lighting energy, heating and cooling energy, and fan energy. Performance design aims to deliver sustainable buildings that optimize energy and water consumption, along with other metrics of building operation; in doing so, performance design also delivers buildings that enhance productivity, attentiveness, and the well-being of users within the space. This is a great read full of excellent information! I especially loved that you included the importance of sunlight and the impact that it can have on our mood. Often time, when working in an office environment, we can be deprived of that much-needed sunlight. What an inspiring post. Productivity is key, but it may value very little with no proper health. This is why your points on daylight exposure are so important. Natural light is still the best.